My grandmother was a great cook. I still have memories of her giving instructions to the cooks to make fish curry on special occasions like weddings, where she will be invited to share her expertise. Her fish curry was very popular. The authentic fish curry in Southern parts of India is prepared in clay or earthenware pots which gives it the unique flavor and aroma. The combination of mashed Yuca and fish curry is a delicacy in Southern parts of India. With the innovation of non-stick pan and pots, the use of these earth friendly clay pots vanished. It has become more over a decorative serving bowls nowadays. You can see these brick colored serving pots in star hotels in India. Gazing through one of the cookbook that focuses on low fat diet in the library, my eyes got stuck on the recipe for 'Fish Tagine' which reminded me of the fish curry that is made in clay pots in Kerala. The illustration was rather simple and it only required a stoneware or bakeware to prepare it in the oven. 'Tagine' is North African dish which is named after the special earthenware pot used to cook meat that has a dome shaped lid which retains the flavor of the dish with the process of condensation and makes the meat butter-tender. Moroccan Tagine dishes include a whole array of spices with preserved lemon and fresh vegetables layered between the meats. Fish Tagine is prepared with fish steaks that have firm meat like Mahi-mahi, Halibut, Cod or Seas bass. Everyone in my family loves fish, so it was an easy pick for tonight. I was keen to see the outcome and it turned out to be a wonderful dish despite of my little dismay. This is a definite keeper for me. I prepared this dish for dinner with some Lemon Cilantro rice. The fish were juicy and properly infused with the blend of spices and was unanimously remarked as delicious. Experimenting with variations in ingredients is the adds-on I try on recipes that might sometimes end up in cooking disaster too. But changing or twisting here and there in recipes is something I am passionate about. 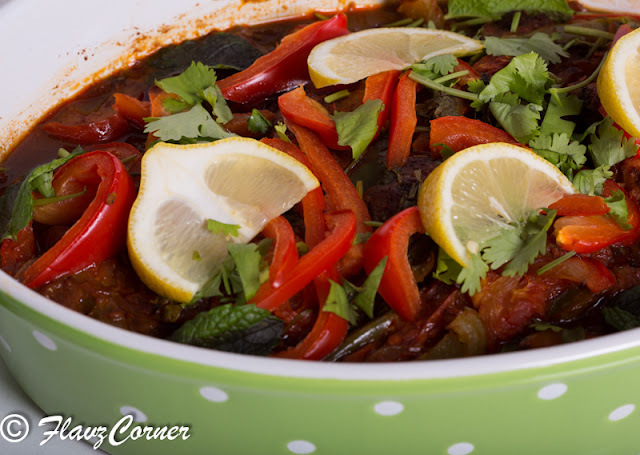 This particular recipe was also subjected to variation from the traditional Tagine recipe. Heat a non-stick pan with 1 tbsp olive oil and cook the garlic and ginger till light brown. Add the rest of the ingredients for the marinade except tomato paste and lemon juice and cook for 2-3 minutes until the raw smell is gone. Grind the ingredients with lemon juice and tomato paste to get a thick paste. Add little bit of water if necessary. Reserve 1 tbsp of marinade and coat the fish fillet with the rest of the marinade and refrigerate for 30 minutes. Heat a non-stick pan with 1 tbsp of olive oil and cook the sliced onions, tomatoes, peppers and 1 tbsp of marinade for 2 minutes with salt and pepper. Grease the stoneware or bakeware with olive oil or cooking oil and arrange half of the vegetables at the bottom of the baking dish. 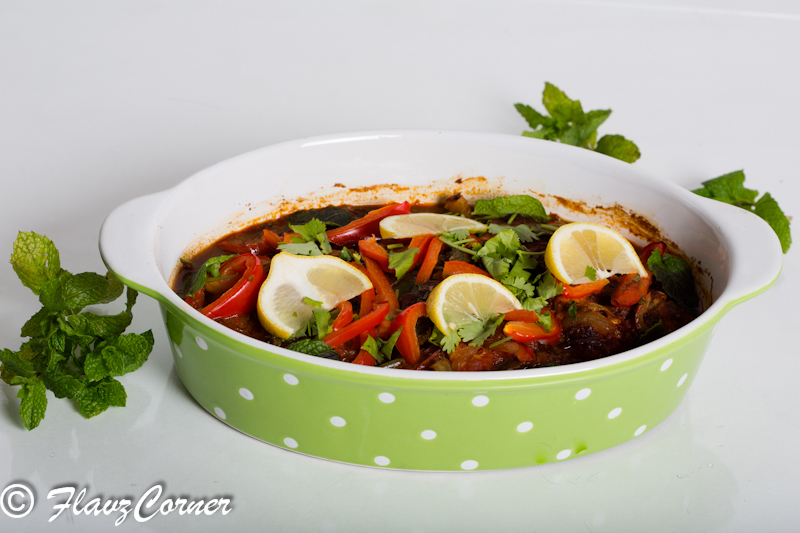 Layer the marinated fish fillet over the vegetables; reserve the liquid from the marinade. Arrange rest of the vegetables on the fish and garnish with Cilantro. Pour the reserved liquid from the marinade over the layered fish and vegetables. Cover and bake for 40 minutes. Uncover the dish and broil for 5 -6 mins to reduce any excess juice. Garnish with some fresh Cilantro and lemon wedges. Serve with Lemon Cilantro rice. Prepare the instant rice according to the package direction with salt to taste. While the rice is warm, add the olive oil, lemon juice and chopped Cilantro and mix well. Serve with the oven warm Fish Tagine. Other vegetables like Potatoes, carrots, celery olives etc are used. Spices like cumin, cinnamon, saffron are used in Traditional recipe. I omited those spices in this recipe. In traditional Tagine recipe no precooking of vegetables are done. I had slightly cooked the vegetables and marinating ingredients. Adjust the spices according to your palate. 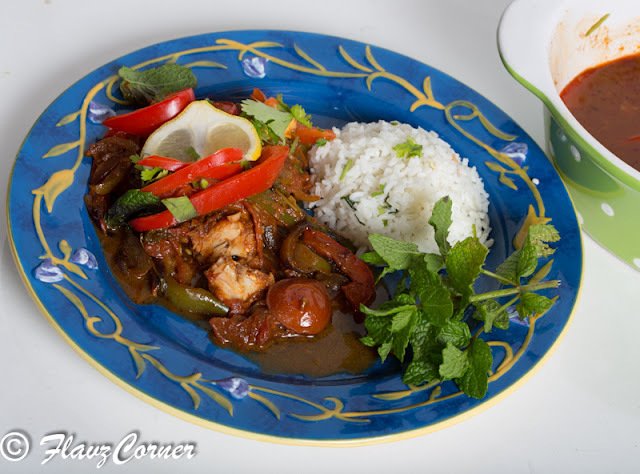 You can serve Fish Tagine with plain rice too. This must be really tasty.............appreciable work Shibi!!!!!!!! This sounds amazing, Shibi! Glad that you joined us at Global Food Friday!